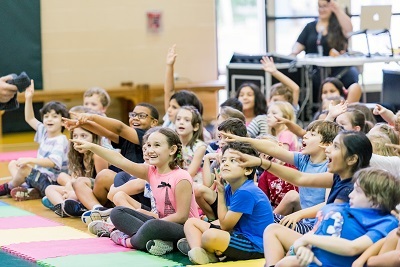 This spring, our actors and teaching artists toured more than 36 Houston-area schools with Oskar and the Thunderous Thingamabob, a play that we commissioned in response to Hurricane Harvey and its impact on the community. 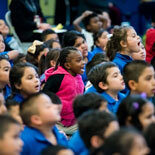 This high-energy Alley production told stories of grit and resilience, teaching more than 25,000 students K-5 how to cope with stress and bounce back after crisis. 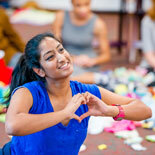 -Transportation cost for the Oskar cast and crew to perform at 40 schools. 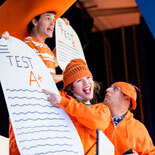 -Purchase materials to create costumes for one Oskar play. 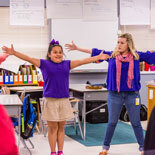 -Fund one Staging STEM residency for a Houston-area elementary school, teaching students STEM subjects through the art of theatre. 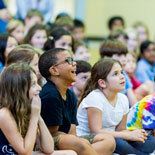 -Pay for craft supplies for an Alley Play Makers Summer Camp for students grades K-5. 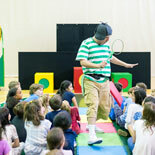 -Sponsor one Alley Play Makers Summer Camp scholarship for one K-5 student. -Provide a preview dinner for middle and high school students participating in the Alley Summer Conservatory. -Purchase supplies for a Staging STEM Teaching Artist to teach STEM subjects through the art of theatre for one school year. For more information, please contact us by email or at 713.315.3371.